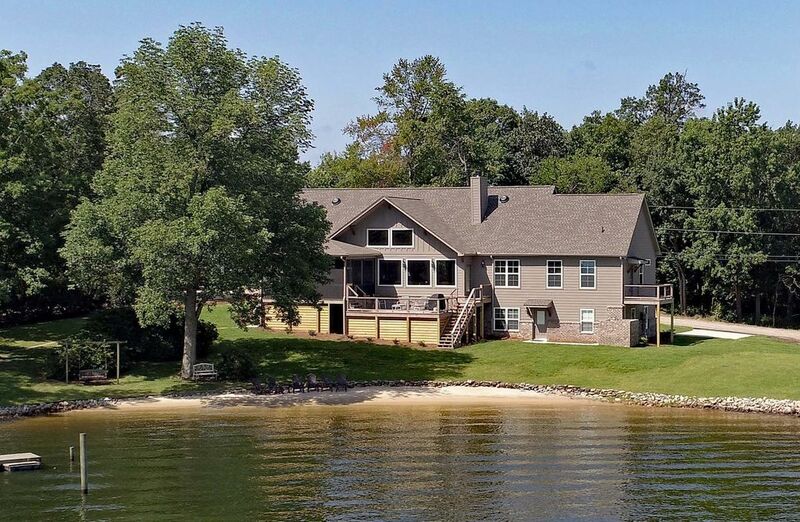 For a truly incredible vacation experience, come live the beach life in this all new vacation rental with it's private 125 ft. real lake sand beach - so rare at Lake Murray! After ten years of VRBO rentals, we knocked down and completely replaced our original lake house in 2017 on this unique 1-acre lot with a much larger, modern custom-built vacation home. This fabulous setting offers stunning, unobstructed views of the lake from your 1,000 sq. ft. open floor plan Family Room - Dining Area - Kitchen with its 16 ft. vaulted ceiling, from your Den, and from every bedroom. We have transformed a wonderful lake property into a fabulous year-round vacation getaway with a sun deck, screened porch, billiards, stacked stone fireplace, high speed wireless internet, smart TV's, hot & cold water lakeside outdoor shower, and a huge new private floating dock. It is a wonderful venue with large open areas.....perfect for multi-generational family vacations, executive workshops/retreats, or getaway weekends. Many dates in 2019 have already been reserved by families (60% of whom have rented previously), and we have even started bookings in 2020.....so we encourage you not to delay your selection. Weekly rates for non-peak periods are discounted to provide one free night (7 nights for the price of 6). Monthly rentals provide significant savings - 30% off in the fall and spring and 50% off in the winter. The aerial photos show the new house on the isolated property with the unassigned adjoining peninsula, which together form a scenic panorama of your very own personal "Bordeaux Bay". Your bay opens directly into the main body of the lake (not a cove) providing you a superb lake vista with great swimming, boating, and fishing. This new vacation home has its very own, very private, manicured natural lake sand beach that slopes gently into the water, out as far as you can walk. This natural lake sand beach, accented by a Tennessee field stone border, is just a few steps out your back door, as you can see in the photos. A real lake sand beach is found in precious few locations at Lake Murray..... there is no gooey lake shore mud here! Having your personal, easily accessible beach right in your backyard makes for such an enjoyable vacation experience. This very rare, natural beach uniquely differentiates our all new construction vacation home from any of the other vacation rentals at Lake Murray! Your family will thoroughly enjoy this very comfortable house with great views and great swimming. You will very likely see osprey, blue heron, Canadian geese, mallards, turtles, and sometimes bald eagles. White-tail deer tracks across your beach are a common sight. The entire house is brand new construction. It has a huge 1,000 sq.ft. open floor plan beamed ceiling Family Room - Dining Area - Kitchen on the Main Level, with a 50" wood burning stacked stone fireplace and seven huge picture windows providing a fabulous view of Lake Murray. Your fully equipped custom kitchen has all new top-of-the-line stainless steel appliances, with granite countertops for the kitchen cabinets and the huge island. All of your cooking essentials are there for you - pots, pans, cooking utensils, a combo conventional & convection stove, an integrated microwave/second convection oven.....everything that you will need. A propane grill is located just off the back deck. The house has both a Recreation Room as well as a Den on the Lower Level, along with a spacious two-car garage. The Rec. Room has a regulation 4' x 8' Tiffany model Presidential slate pool table and spectator viewing chairs, along with an entertainment system. The Family Room Samsung 50'' Smart Flat Screen LCD HDTV (with 200 channel cable) is great for your favorite TV shows and for sporting events. Free high speed cable-based wireless internet is also provided for your use throughout the house. The lakeside sun deck and screened porch face northeast and your private bay, making them perfect for all-day use. Your outdoor shower (with both hot and cold water) is great for rinsing off that beach sand. The room layout diagram (in the photos section) indicates a portion of the house that is private, and not accessible to our guests. These private areas are NOT used by the owners during any portion of the rental period. The climate controlled portion of the house is 4,000 sq.ft. The portion that is rented to our guests is 3,030 sq.ft. During our decade using VRBO for the original lake house and the new house, over one-third of our guests have been from multi-generational families with children who had previously rented with us one or more times. During the years, a number of families have stayed with us for a 3rd, 4th, 5th, and even an 8th time. In our over 250 rentals, we have had families from over 30 different states, with two thirds of those families coming from outside of South Carolina. Guests have come from as far away as CA, OR, MT, MN, NY, VT, Canada, France, and England. We have had multiple guests from Hilton Head and Myrtle Beach, SC as well as from the Florida coasts! Rentals for spring break, Masters Week, USC Graduation, the summer, Thanksgiving, Christmas, and month-plus snowbird rentals have all been very popular through the years. At the water's edge, across your lawn of lush green Palisades Zoysia grass, is a pergola (arbored patio sitting area) with an outstanding 3.5 mile lake view. It's a wonderful spot for watching the sunrise or moonrise and the July 4th fireworks on Dreher Island. From most anywhere on the property you have great views of several osprey and blue heron nests in the trees on the small island just off shore. A concrete fire pit, with plenty of firewood, is located just off the beach and is great for evenings under the stars! Take a look back to the west across the other shoreline, and you will be treated to one of those magnificent South Carolina sunsets. Being able to watch both the sunrise and the sunset from your vacation property is a very rare, very nice vacation bonus! All of your essential boating needs are addressed with your own concrete boat ramp and a huge, brand new PVC floating dock (no splinters). You can experience great fishing right off the property or the dock, or in the nearby coves. Pull back from your new dock and you are in open water - over 60 feet deep only 300 yards off shore. The lake is over 3/4 mile wide here…..great for skiing, tubing, and jet skis. Your bay is shielded by both a small island about 150 yards off shore, and a peninsula to the east. This configuration of the property provides for a wonderful protected swimming area, either out from your beach or off your large floating dock, which has a swim ladder. The water is always at least 10 feet deep off the end of your dock. The new dock also has a jet ski parking port. Your modern Bordeaux Bay vacation home is located on a professionally landscaped one-acre lot, with 125 ft. of natural lake sand beach and 425 ft. of total waterfront (expanded to 800 ft. when including the bay side of the adjoining peninsula). At the east side of the property is a boathouse (shown in aerial photo beside your dock) that is not rented, but used for storage. With its very unique setting, the all new Bordeaux Bay is sure to provide your family with a truly memorable Lake Murray getaway experience. The lake house is located on the south shore of Lake Murray, northwest of Lexington, SC, and just north of Climax, SC. There is essentially no vehicle traffic on the street, since the house is literally "at the end of the road”. Unfortunately the Google Earth photos currently available of the house are way out of date. The Google Earth aerial view is from the day that we knocked down the original house, and the street view is a photo of the original house. NOTE - For a number of reasons we DO NOT allow pets, parties, weddings, wedding receptions, or tournament fishing groups at Bordeaux Bay. Keywords: Very private sand beach, comfortable lakehouse, great view, relaxing vacation, Lake Murray rental, lakefront luxury home, lakefront rental, lake house, south shore rental, executive retreat, corporate workshop, open floor plan, new private dock, private boat ramp, rent by owner, Columbia, SC, Lexington, SC, 4 bedroom rental, 3-1/2 bathrooms. We bought this particular property because of it's magnificent view of the lake from the house, it's very unique, natural white lake sand beach, and it's expansive 'bay like' shoreline. The natural lake sand beach right at your doorstep makes this vacation rental different from all others. We have poured a tremendous amount of energy into the property, to enhance this naturally beautiful setting, and to provide you with a superb place to relax and enjoy Lake Murray. And now we have replaced the original house with a brand new large, modern house for you to enjoy. The adjoining wooded peninsula to the east and the small wooded island 150 yards offshore to the north provide a natural isolation barrier for the property, forming your own private 'bay area' - hence the name 'Bordeaux Bay'. The whole 'bay' is there for you to soak up and enjoy from the Family Room and Kitchen, from the Sun Deck and Screened Porch, from your beautiful yard, and of course, from that real lake sand beach. All the bathroom vanities have granite counter tops. Starter toilet paper is provided. Laundry Room has laundry tub with pull out faucet. A great location to get away from it all. The house is on the south shore of beautiful Lake Murray. The new lake house has its own private, natural lake sand beach right out the back door! A superb view of your very own, very private sandy beach, your isolated bay, and the lake. As you can see from the photos, the lake house is right on the water. Cordless phones in the Family Room (Main Level) and Den (Lower Level). Unlimited long distance calling with the continental U.S. (all day/all night). Heat pump central heating with integrated supplemental heater strips and air conditioning throughout the house. Two zone temperature control - Main Level and Lower Level. Heat pump central heating and air conditioning throughout the house. Two zone temperature control - Main Level and Lower Level. Sheets and pillowcases provided for each bed. Bath towels, face towels, and wash cloths provided. Brand new full-sized washing machine. A laundry tub is also available for your use in the Laundry Room. Inside - 50" wood burning stacked stone fireplace, with gas starter in the Family Room that is open with the Dining Area and Kitchen. Outside - Fire pit just off the beach. Seasoned firewood on hand. A two car garage, concrete driveway, and separate concrete parking pad. Additional off-street parking is available in a graveled area at the north end of the property. A very spacious two car garage. Automatic garage door openers. Note that the owner's jet ski is parked in one bay of the garage. Cable supplied, high speed wireless internet. Bath towels, face towels, and wash cloths provided for each bed. Extras available in the Laundry Room. Please bring your own beach towels. Free high speed wireless internet accessible throughout the house as well as from the Sun Deck and Screened Porch. Family Room is open with the Dining Area and the Kitchen, all with hardwood floors. The 1000 sq. ft., 16 ft. high vaulted ceiling room has a wonderful view of the lake through 7 huge picture windows. New Bosch stainless steel dishwasher in the Kitchen Island - it is VERY quiet! Several of our guests have commented on how very, very, very quiet the dishwasher is. New 26.8 cu. ft. KitchenAid french door stainless steel refrigerator with ice maker. Door water & ice dispenser. 3-tier freezer drawer. Separate 18 cu.ft. refrigerator available for use in garage. New KitchenAid stainless steel 5-burner propane gas cooktop with electric combination conventional/convection oven. Two new KitchenAid stainless steel combination conventional/convection ovens. New 1000-watt KitchenAid stainless steel Microwave-Convection Oven combo unit. 4-slot pop up toaster provided. Dishes and utensils provided - flatware, steak knives, etc. Everything that you need! The Dining Area is open with the Family Room and the Kitchen. The 1000 sq. ft., 16 ft. high vaulted ceiling room has a wonderful view of Lake Murray through seven huge picture windows. 1. Samsung 50" smart flat screen LCD HDTV with DVR is in the Main Level Family Room bookcase. 2. Den has a Samsung 40" smart flat screen HDTV. Independently operable 200 channel cable service for both TV's. Available in the Rec. Room on the Lower Level. In Rec. Room on Lower Level. Miscellaneous reading material available in the Family Room on the Main Level and Rec. Room on the Lower Level. A Rec. Room is on the Lower Level with a regulation Presidential pool table and an entertainment center. Chess, checkers, dominoes, board games, etc. Eclectic mix of CD's are available. Regulation 4'x8' Tiffany model Presidential slate pool table. Cues, bridge, and chalk. Rec. Room is 18' x 18', so you can truly enjoy your game of billiards. Player and spectator viewing chairs. A few toys are in the Rec. Room closet on the Lower Level. Mix of DVD's are available. Star Wars, Golf, Tennis, Basketball, Call of Duty... Also board games - Monopoly, Scrabble, Chess, Checkers, etc. Great yard....lots of lush Palisades Zoysia grass. Very nice professional landscaping. A fire pit with plenty of aged firewood is just off the beach. In the two car garage. A screened porch is out the sliding glass door from the Family Room on the lake side. It has an outdoor table with chairs for eating outside, along with other outdoor lounging chairs. Off the Family Room - Dining Area - Kitchen on the lake side are both a Sun Deck and a Screened Porch with deck/patio furniture. The Screened Porch has an overhead fan. A brand new, large floating dock is out your back door.... great for diving and swimming. Has a swim ladder, jet ski port, & boat slip. Several water floats are typically in the garage for your use. Several nice golf courses are in the area. Stairs must be used for the front door, garage door, and lake side Main Level entrances. The back entrance to the Den on the Lower Level is at ground level. From the Lower Level, stairs are needed to get to the Kitchen and Dining Areas on the Main (upper) Floor. The property has a very private, natural lake sand beach that extends 125 feet along the waterline. The very clean, natural sand beach is extremely rare at Lake Murray. This is sand naturally generated by the lake, not shipped in. The beach has both sunny areas and partially shaded areas, all day long. The large brand new, PVC boat dock has a jet ski port and a swimming ladder. All bed linens and towels are provided. Extra towels are in the Laundry Room. Starter dish detergent, paper towels, and bath room tissue are provided. All summer weeks are Friday to Friday. Other start/end dates are available for remainder of the year. What a great house in a great location! We were ecstatic when we walked in the front door! The house was great for our needs and had everything one could ask for. Would definitely recommend this house to anyone! Hope to stay here again in the future! Wonderful! Spacious, clean, and amazing property. We loved this home. So much space inside and out. Every amenity you can think of is present. Bordeaux Bay is beautiful and quiet providing the perfect vacation spot. Everyone loves staying at Bordeaux Bay! In 11 years of vacation rentals, we've always been rated "5 star" by all our guests. We enjoyed a week at this beautiful vacation home! The house is exquisite and set up perfectly. The sandy beach area was great - the best part is that while our grandkids played, I was able to sit under the shaded tree and relax. We loved watching the birds and kayaking to the island. Our whole family had a super time and we're definitely looking to spend another week here next year. Just perfect! Multigenerational families really enjoy Bordeaux Bay! The brand new house and dock provide the perfect facility. Add in the natural lake sand beach, and the result is a wonderful vacation experience for everyone. We just keep going back! The beautiful setting, privacy, sandy beach, pier, and now the beautiful new house make it one of the best vacation spots we have ever been to! This multigenerational family first stayed with us in 2012, and returned again this year for their vacation FOR THEIR 5th TIME! They enjoyed our original house and the beach, but clearly enjoyed the added comforts and space of this new lake house to go along with their beloved beach. They have already reserved their preferred week in 2019. Each year, about one third of our guests are comprised of our very valued repeat customers, who have stayed with us at least once before. This home is absolutely beautiful and my family loved our vacation. We were able to place our boat at the dock and the cove was private. We caught many fish right from the edge of the yard and enjoyed the evening campfires. The kitchen had many of the essential items and the home was very clean and spacious. It was tough to leave, but we will definitely be returning for another stay. Great family memories were made, thank you! Bordeaux Bay is just a really great place for a family vacation! The brand new spacious house, the huge dock, and the very unique natural lake sand beach provide a fabulous setting to make for a truly wonderful time with your family. BOAT/SWIM DOCK - A huge, brand new floating dock is just beside your beach. The dock boards are textured PVC, so no slipping or splinters. An aluminum swim ladder is provided, along with a nice boat slip. FIRE PIT -- A concrete fire pit is on the property just off the beach area, near the pergola. Aged, stacked firewood is provided. It makes for great entertainment for evenings under the stars! BICYCLES -- One adult 21-speed and one 10-speed bike are available for your use. BIRDWATCHING -- An osprey family and several blue herons nest in the trees on the small island just offshore. You have a great view of their approach to the nest over the bay from the back deck, the beach, or really anywhere in the back yard. Bald eagles nest off to the east of our property, and sometimes perch in nearby trees, surveying the area for food. The osprey and bald eagles are huge, beautiful birds! OTHER AREA ATTRACTIONS include the Columbia Riverbanks Zoo, the Newberry Opera House, and Dreher Island State Park. June through mid-August - Week long rentals only (Friday-to-Friday). All other times require 4 night minimum stays. Our peak period is mid-May through Early-September (no weekly discounts). Weekly rates for non-peak periods are discounted to provide one free night (7 nights for the price of 6 = 14% discount). Monthly (28+ night) rentals provide significant savings - 10% off for peak, 30% off for fall/spring, and 50% off for winter. Long term rentals are available - e-mail or call for details. Pets are only allowed for guests who have previously stayed with us, and we have a pet fee.